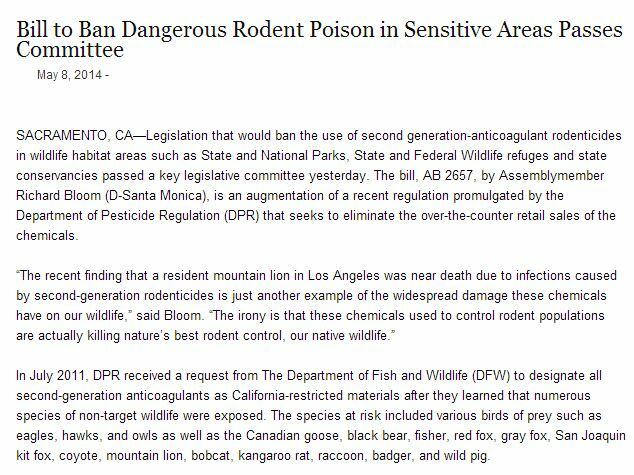 “The bill, AB 2657, by Assembly member Richard Bloom (D-Santa Monica), is an augmentation of a recent regulation promulgated by the Department of Pesticide Regulation (DPR) that seeks to eliminate the over-the-counter retail sales of the chemicals. This effort by the assembly members only furthers the advocacy of professional Riverside rodent removal companies, like Rodent Guys Pest Services, who utilize safer, alternative methods in eliminating pest animals. These experts understand that rat poison causes adverse health effects on those who come in contact with deceased rodents, especially wild animals which can possibly move around neighborhoods near their habitats. Rodenticides, or rat poison, are pest control substances used to eradicate rodents that usually carry diseases, and often cause damage and destruction to property. The most popular rat poison available to consumers is an anticoagulant, which suppresses a rodent’s ability to produce Vitamin K, an essential element in forming blood clots. Within a week or two of ingesting the chemical, the rodent slowly dies because of internal bleeding. Though home and property owners find poisoning rodents convenient, it’s not as simple as it seems because it can initiate unnecessary secondary poisoning. When rodents consume the poison, they become weak and vulnerable, making them easy targets for wildlife prey. Contaminated rodent carcasses potentially bring more harm to wild animals, and can possibly contaminate soil and water sources as well. To avoid these detrimental effects, homeowners should instead seek help from dependable Riverside gopher removal technicians, who employ different potent methods that are non-toxic for pets and wildlife. These professionals can trap the rodents in their burrows and inject just the right amount of carbon monoxide through their special equipment. Through their efficient control techniques, they can get rid of destructive pests in the property without putting other animals at risk, too.